The first time the general public glimpsed at the newly titled and newly married Duke and Duchess was when the couple departed Buck Palace for a mini-honeymoon. Both were dressed "business casual" with Kate in black Ralph Lauren blazer that she already owned for some time, over a pleated blue Zara dress with belt, and of course her L.K. Bennett wedge espadrilles. Obviously this was some time ago and I cannot find any information on the exact Zara dress. Kate has a penchant for wearing clothes that she got years before - I get the feeling she doesn't throw much of it out - so that also makes it harder to get a handle on the details of an item. A quick peek at the current Zara dress selections however lets us put the estimate anywhere between $40 - $99 U.S.
Zara dress, no longer available. For the repli-Kates we are looking for a sleeveless, easy and roomy dress, preferably pleated. 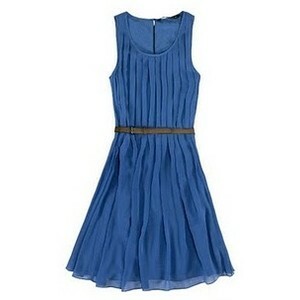 Our first look is an easy blue dress by The Limited. It definitely evokes the easy and comfortable wearability of Kate's dress and even has a round neckline. Although it doesn't have a belt (an easy fix anyway!) it has a defined gathered waist. Retails for approximately $89.90 but as low as $44.99. The Limited - easy draped bodice dress. Another good "copy Kate" is this Alex Marie pleated dress. This is probably the closest version to Kate's right now. True to form it is has pleats all along the length starting at the round neckline. It is sleeveless in style and has a waist sash detail. This dress currently retails for $129 U.S.
Alex Marie via Dillard's - Veronica pleated chiffon dress. This Mango dress has a narrower boatneck style neckline than the original, with pleated skirt, and has a waist band. Retails for approximately $64.99 U.S., as low as $44.99. The last repli-Kate is also very similar to our original inspiration with a round neckline, sleeveless style, and of course the full-length pleats. The only glaring differences are that it has a horizontal pleated hem and of course that it is red. I'll admit that I actually like this one better than the rest, even the original! This dress currently retails for approximately $119.50 U.S.
INC International Concepts via Macy's - sleeveless pleated A-line dress. Wow, thanks Anon! Its a great one, I'll update soon.